If you can’t get enough of the science behind our products – especially when it’s delivered by Product Education Specialist Dani Catania – or you missed out on the action the first time around, you’re in luck! 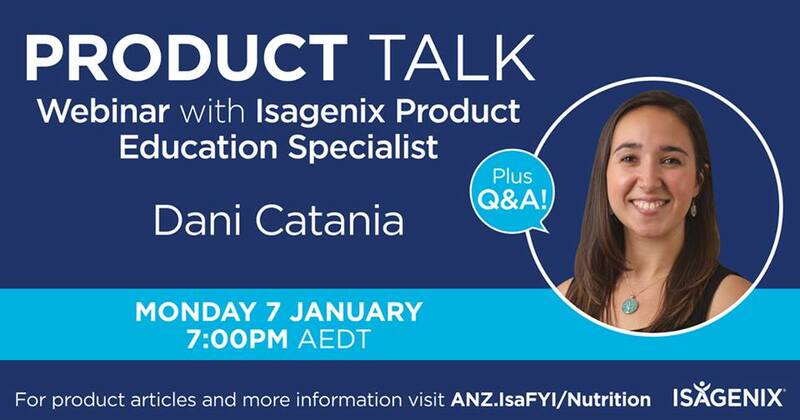 Catch up on the January Isagenix® ANZ Product Talk Webinar. In this episode we cover all things cleansing and the science behind intermittent fasting! Follow the timestamps below to fast-forward to the information you need for your own journey or for tips you can pass on to your team. Do you have a question that needs answering? Submit your enquiry to ProductQuestionsANZ@IsagenixCorp.com. 6:05 – What is an Isagenix® Cleanse Day? 13:48 – Daily Cleansing, one-day or two-day Cleanse? 28:02 – Is it OK to have more than 4 cleanse days a month? I’m thinking I would like to do 2 cleanse days every week. 29:05 – Is there any research on Isagenix and how it may positively impact our microbiomes? Can we tell our potential customers that Isagenix is great for gut health from a microbiome perspective? 30:38 – Can you please explain why drinking coffee on a cleanse day is a No No? I have many associates who ask all the time. Can you also explain why Ionix Supreme works well at night time for some to prepare for a restful sleep? 32:50 – Why are the shakes an important part of the Cleanse System? 35:24 – What time should I stop eating on the night before a Cleanse Day? 38:11 – Is broth OK on a Cleanse Day? 39:39 – Thanks for tuning in!